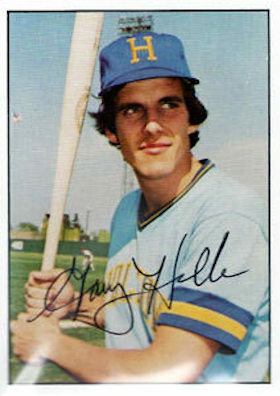 In the 1970s Gary Holle was a dual-sport phenom (baseball and basketball) from upstate New York who had a six-year minor-league baseball career and a two-week stay with the Texas Rangers in 1979. At 6-feet-6 and 210 pounds, Gary Holle was an intimidating and dominating presence on both the hardwood and on the diamond. He achieved his earliest athletic prominence in basketball. As a gangly freshman who barely made his high-school junior varsity team at Catholic Central High School in Troy, New York, Holle through hard work, determination, and grit became an all-star center whose scholastic career culminated with regional honors and basketball scholarships to Xavier (Cincinnati) and Siena College (Loudonville, New York). In 2015 he still held Catholic High’s single-game scoring record of 53 points (in an era when there was no three-point goal). Brewers general manager Jim Baumer sang Holle’s praises: “[He is] the top first baseman prospect in our entire organization.”5 However, Holle’s seemingly limitless potential and a highly productive six-year minor-league career were not enough to get him more than the proverbial “cup of coffee” experience in the major leagues. After the season Holle returned to Siena to earn his degree in sociology, then played in 1977 for the Holyoke (Massachusetts) Millers of the Eastern League, batting .253 with 30 home runs, 25 doubles, 75 runs batted in, and 50 walks. Holle split the 1978 season between the Millers and the Spokane Indians of the Triple-A Pacific Coast League. He hit a combined .277 with 18 home runs and 84 runs batted in. On December 15, 1978, the Brewers traded him to the Texas Rangers with pitcher Ed Farmer for pitcher Reggie Cleveland. On June 2, 1979, at Arlington Stadium, Holle played in his first major-league game. He pinch-hit for outfielder Johnny Grubb and grounded out against Baltimore closer Dan Stanhouse in a 5-4 Orioles victory. When Baltimore, Boston, and Milwaukee threw five consecutive right-handed starters at Texas, the right-hand hitting (and left-handed throwing) rookie rode the bench. The next day Holle got his first (and only) major-league hit. Pinch-hitting for Rangers shortstop Larvell Blanks, the rookie stroked a double over the head of outfielder Ken Singleton off Stanhouse. Back home at Arlington Stadium, Holle pinch-hit on June 13 and 14 against the Brewers, each time batting for shortstop Nelson Norman and making an out. On the 13th Holle faced pitcher Reggie Cleveland, for whom he had been traded, and made the last out in a 5-4 loss. On the 14th, in his last appearance in a major-league uniform, Holle grounded out against Brewers hurler Bill Travers. The next day Holle and Ed Farmer were sent to the Chicago White Sox for third baseman Eric Soderholm. With .300-hitting Lamar Johnson and slick-fielding Mike Squires manning first base, the White Sox had no opening on their roster and sent Holle to their American Association affiliate Iowa Oaks, where the young first baseman completed the 1979 season batting .273 in 39 games. The next season, 1981, was Holle’s swan song in Organized Baseball. The perennial top prospect spent the entire season with the White Sox’ PCL affiliate in Edmonton, where he batted .327 with 26 home runs and 88 RBIs. Such production clearly established that Holle had nothing left to prove in the minor leagues. When he returned to the Capital District in 1982, Holle had no plans to become involved with professional athletics: “I wanted to do normal stuff, to get away from the sports stuff.”11 However, within a few weeks, he was back in the sports industry: “A bunch of local businessmen wanted to start a local (Continental Basketball Association) team.” Planning to stay with the project for only a few months, Holle stayed with the team, the Albany Patroons, for a decade as general manager. The Patroons were a successful franchise that seemed to attract first-rate coaches. Albany won the CBA title in 1984 (under Phil Jackson) and in 1987 (under Bill Musselman). In 1990-91, under George Karl, the Patroons went 50-6 and were undefeated at home. Holle became a known and desired commodity in the Capital District sports world, often working for two organizations concurrently: “I seemed to parlay one job into another one.” For example, he became director of Heritage Park, in Colonie, New York, which housed a Double-A baseball franchise. In the first year of his tenure, the club was an Oakland farm team; in the second year, the New York Yankees used the facility for their Colonie Yankees team, which featured such future major leaguers as Derek Jeter, Bernie Williams, Jorge Posada, and Dave Drabek. In 1990 Holle was asked to help organize an arena football franchise that was being contemplated by some of the same business group that backed the Patroons. Holle was a central figure in the application process because he was overseeing the Patroons’ transition from the ramshackle Washington Avenue Armory to a new county-owned sports facility, Knickerbocker Arena, which subsequently was renamed the Pepsi Arena and then the Times Union Center. The complex also became the home of the Albany Firebirds of the Arena Football League, who won the Arena Bowl in 1999, the year before the team relocated in Indianapolis. In 1990 Holle was named director of sales by the SMG group, the operator of the Times Union Center, and, along with other administrative duties, was still serving in that position as of 2015. Holle spent only two weeks in the major leagues, but looks back on his baseball days as memorable ones: “It is about the many laughs you have and the great people you meet. There is such a wide variety of people from all places. They are thrown together because they can do one thing well – pitch, catch, hit. [This group] is in a completely different world, all pulling together for only one reason – to win. It’s a type of confinement with everyone feeling the same pressure. Then suddenly it all ends and you never see [your team members] again.”12 This sense of the sport of baseball as an intense, all-too-short experience, a flashing meteor across the sky that is soon out of sight, is a metaphor that can be aptly applied to Holle’s career in baseball. All biographical and statistical facts were checked by Gary Holle in a telephone interview on June 2, 2015, and verified on at least two of the following databases: Baseball Almanac, Baseball Cube, Baseball Prospectus, Baseball Reference, Fangraphs, or The Sporting News. 1 Gary Holle, telephone interview, June 2, 2015 (hereafter cited as Holle interview). Elder son Gary Jr. followed directly in his father’s athletic footsteps: He was an All-City basketball player for Catholic Central High School and played Division I basketball for Siena College. Younger son Greg starred in baseball at Christian Brothers Academy in Albany and played three years of varsity baseball at Texas Christian University. In 2015 he was pitching for the Laredo Lemurs of the independent American Association. Greg was selected in the amateur draft in both 2007 (New York Yankees) and 2010 (Milwaukee Brewers, the same team that selected his father in the 1976 draft). 2 Holle’s.577 batting average in 1977 was the third highest ever for NCAA Division II baseball players. His statistics were other-worldly that year: .630 on-base percentage, 1.183 slugging percentage, and 1813 on base plus slugging statistic (OPS). He won the NCAA “Big Stick” award as the best hitter in all divisions. Troy (New York) Times Record, March 31, 1976. 3 Utica (New York) Daily Press, May 12, 1975, 12. Coach Rossi was an immediate booster of Holle from his star’s freshmen year, when he hit .354 and led Siena to its best fall record ever (12-5). 4 Schenectady (New York) Gazette, September 10, 1976, 12; Utica (New York) Observer, March 31, 1976. 5 Geneva (New York) Daily Times, July 6, 1976, 22. On the day Brewers GM commented on Holle’s potential, the young slugger hit two triples and two doubles and had four runs batted in as Newark defeated Oneonta, 8-3. 6 Auburn (New York) Citizen Advertiser, August 29, 1976, 11. 10 Holle interview; Mike Cioffi, “Watervliet Native Gary Holle Juggled Two Sports, Excelled at Both,” Troy (New York) Record News, November 2, 2011. 11 Holle interview. There are moments when old teammates do get together. One such meeting happened on July 21, 2014, at Bruno Stadium in Troy, New York, home of the Tri-Cities ValleyCats of the New York-Penn League. Holle took part in a promotion, Capital Region Baseball Heritage Night. He met and exchanged war stories with ValleyCats manager Eddie Romero, who before having a 12-year career as a middle infielder in the major leagues was a teammate of his on the 1977 Holyoke team.